"Zebulun shall dwell toward the seashore; And he shall be a haven for ships, And his flank shall be toward Sidon." "Rejoice, Zebulun, in your going forth." This tribe received their tribal allotment in the third division of the land by Joshua. This took place in Shiloh, after the victory at the Waters of Merom. This division of land also accommodated the northern tribes of Naphtali, Asher and Issachar. 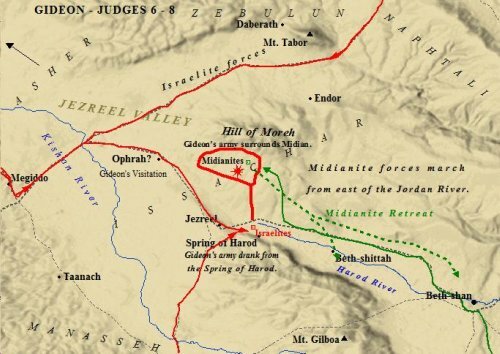 The tribes of Simeon, Dan and Benjamin had been left out of the division of the land at Gilgal (the second division), thus they too received an inheritance at Shiloh. The first division of tribes took place after the defeat of Og and Sihon in the Transjordan. The nature of the borders are unclear. Contradicting reports are handed down to us from antiquity. The confusion stems from two sources; Jacob's Blessing above, and the writings of Josephus in Jewish Antiquities. Not only are the reports we have a bit vague and uncertain, many of the cities listed in Scripture have locations which are uncertain or unknown. These factors combine to create a rather hazy picture of the precise nature of its boundaries. Jacob ascertains the boundaries reach to the shores of the sea. He does not state whether this be the Sea of Galilee or the Mediterranean Sea. What Jacob does specify is that they shall be a haven for ships, implying the tribe will benefit from the sea in someway. Josephus makes a similar claim in Jewish Antiquities, Book 5, Chapter 1. Josephus, however, mentions two bodies of water which belonged to the tribe. "The tribe of Zebulun's lot included the land which lay as far as the Lake of Genesaret, and that which belonged to Carmel and the sea." If one were to base their assumptions on these two passages, it would seem the tribe clearly dwelt by the sea. However, the Biblical description in Joshua 19 fails to mention anything whatsoever about the sea, or the Lake of Galilee. The description throughout the rest of Scripture clearly indicates the tribe's boundaries were landlocked. According to the land description in Joshua 19:10-16, the tribe was bordered on all sides by other of the 12 tribes of Israel. Another cause of confusion may be the English translation of the word "at". The King James Version, along with the New American Standard, translates Jacob's Blessing as saying; "Zebulun shall dwellat the seashore" (underline added). Other versions translate this phrase as reading; "Zebulun shall dwell toward the seashore". Each of the two translations imply something different, hence the cloudiness surrounding the exact boundary. The Biblical description is found in Joshua 19:10-16. The first two verses (vs. 10-11) describe the tribe's western border. "Now the third lot came up for the sons of Zebulun according to their families. And the territory of their inheritance was as far as Sarid. Then their border went up to the west and to Maralah, it then touched Dabbesheth, and reached to the brook that is before Jokneam." Interestingly, two of the three cities mentioned, Dabbesheth and Maralah, have locations which are unknown, or uncertain at best. Some have associated Dabbesheth with Dabsheh. This city, however, is to the northeast of Cabul, which would seem to rest outside the boundaries assigned by Scripture to the tribe. The location of Jokneam is known. This city lay to the southwest of the Kishon River. Jokneam defines the western front according to Joshua. It is one of the southernmost cities of Zebulun as well. Verses 12-13 list the eastern border of the tribe. Many of the cities mentioned in these two verses remain buried under the sands of time, yet a few have surfaced for identification. "Then it turned from Sarid to the east toward the sunrise as far as the border of Chisloth-tabor, and it proceeded to Daberath and up to Japhia. And from there it continued eastward toward the sunrise to Gath-hepher, to Eth-kazin, and it proceeded to Rimmon which stretches to Neah." The cities mentioned in verse 12 lie on a west-east axis. The location of Japhia does not seem to align with the cities as they are mentioned in Scripture. From Sarid to Daberath is a true eastern axis, yet then Scripture seems to backtrack north and west to Japhia. Japhia is just one of the cities which remains hidden within Zebulun's borders. This must be kept in mind when reading the Scripture accounts. Many of the landmarks and cities mentioned have yet to be identified. If one attempts to interpret Biblical geography based on what is known today, at times the picture painted can be a murky and muddy one which seems to make no sense. Archaeology has unearthed many of the names and places mentioned throughout the Bible, yet many more remain hidden, just as many sites in the Holy Land remain un-excavated. Verse thirteen begins the northern border. The locations of Eth-kazin and Neah are uncertain. Gath-hepher and Rimmon, however, have been identified. Gath-hepher lie almost in the center of Rimmon to the north, and Daberath to the south. As depicted on the city map by the red and yellow dotted lines, the boundaries to the east and north take on a different shape according to whichever theory one prescribes to. The bottom line is these boundary allocations are simply not known for certain. Verse fourteen concludes the boundary description. Verse fifteen simply states cities which were found in the interior of the tribe. "And the border circled around it on the north to Hannathon, and it ended at the valley of Iphtahel. Included also were Kattah and Nahalal and Shimron and Idalah and Bethlehem; twelve cities with their villages." The valley of Iphtahel is an interesting site. This ancient site rests at the crossroads of modern day intersections, which mirror those of the ancient times as well. Roads to Nazareth, Sepphoris, Acre, Tiberias, and the Jezreel Valley branch out from the valley of Iphtahel. Occupation of man reaches back to the Neolithic period, from ca. 8,300 B.C. to 4,500 B.C. In Biblical times it was a strategic location, with numerous wells and springs throughout the area. The Biblical site may have been up to ten times larger than the present site. Excavations have show Iphtahel possessed thousands of residents in Biblical times. The site also sat on an important trade route connecting Jokneam to Hannathon (courtesy Biblewalks.com) . Thus Scripture seems to indicate the northern boundaries stopped at the valley of Iphtahel. Wayne Jackson wrote an interesting article in which he outlined several different theories regarding the vague and uncertain boundary. H.C. Leupold and Derek Kidner indicate the text from Jacob's Blessing in Genesis does not specify Zebulun lived on the seashore. They suggest the grammar of the verse indicates the tribe will live near the seacoast. Both agree the interpretation, as stated above, may read "toward the seashore". Kidner goes one step further, indicating Moses blessing of Zebulun and Issachar state they "shall draw out the abundance of the seas". Their location close to the sea, both the Sea of Galilee and the Mediterranean Sea, would provide them with the ability to branch out into maritime trade. Both tribes were to benefit greatly from sea trade due to their proximity to the sea, not the fact they actually dwelt on the seashore. C.F. Keil agreed with this theory as well. He stated in his book, The Pentateuch, that Jacob's intention was to point out the benefits they would receive "from the situation of its inheritance". Sharon Pace Jeansonne took Jacob's Blessing in another direction. She states this prophecy may indicate borders during the Solomonic age of Israel. Under King Solomon, Israel would have occupied the land from the Mediterranean to the Sea of Galilee. I Kings 4:21 gives the expanse of Solomon's kingdom. 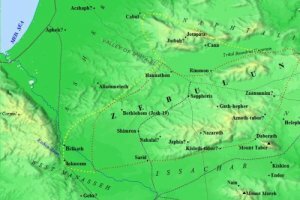 Another theory concerns the migration of the Israelites themselves throughout all of Canaan. One must recall the census of the New Testament which drew Joseph and Mary back to Joseph's tribal home. Mary and Joseph seem to have been living in Nazareth at the time. The census required them to travel to their home city, thus Joseph and Mary traveled to Bethlehem. The reason being Joseph was from the tribe of Judah. Bethlehem is located within the tribal allotments of Judah. (Luke 2:1-5). Thus, Israelites were prone to travel and settle outside of their home cities and tribal boundaries. G. Ch. Aalders believes shifts in the population may have placed the tribe at the seashore in later times. This was a common occurrence in antiquity. Populations shifted frequently due to war, famine, natural disaster, and other such occurrences. Scholars and academia point to the migration patterns described in the Old Testament, and those unearthed by archaeology during the Old Testament time period, as the two are very consistent with each other. One example of this is the narrative of Abraham. His migration into Canaan describes events which are known to have occurred at the time he is believed to have lived. Regardless, scholars differ as to the interpretation and translation of Jacob's Blessing. However, all scholars agree the border description in Joshua 19 is vague and uncertain. Perhaps if cities are unearthed in the future which remain hidden presently, the borders of will be defined with more clarity. 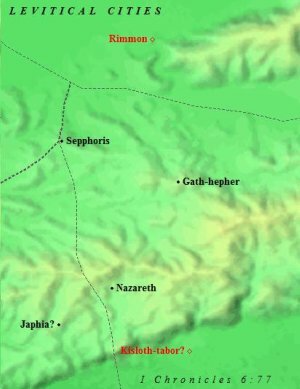 Sephhoris was an important city of Zebulun in the Old Testament. In fact, some scholars regard Sepphoris as being the tribe's first city. Sepphoris in the New Testament was most notable for its proximity to Nazareth. Though not mentioned in the city list, and indeed looked down upon by the Jews of the New Testament, Jesus Christ would make Nazareth the most famous city on earth. Aijalon was the burial place of Elon, one of the Judges of Israel from this tribe. Josephus made a heroic defense at Jotapata, another city within the tribal borders. Mount Tabor was a very significant mountain in antiquity. It was a holy mountain. It is quite likely that this tribe, along with Naphtali and Issachar shared a place of worship on Mount Tabor. These tribes cooperated with each other and are mentioned in conjunction throughout the Old Testament. The Via Maris was an ancient trade route which connected Egypt and Syria, running along the Mediterranean coastline of Palestine. At Dor, the Via Maris cut through the Jezreel Valley en route to Damascus. This cut through the tribe's land, thus opening them up to a number of outside influences and threats. These influences seemingly played a role in the Israelites losing focus of God's call, and mingling with the foreign gods and pagan religious practices and lifestyles of their neighbors. The soil produced an abundance of olive groves and vineyards. Rich harvests were gathered off the slopes. The land was well watered by multiple sources. Zebulun's land itself was diverse, ranging from rugged mountainous terrain, to forests and lush valleys. Most of the cities were located in the highlands, as the Canaanites occupied the cities of the valleys. The Plain of Aschosis, which Josephus connects with Cana, was very fertile and productive. It was in Cana which Jesus turned the water into wine at the wedding feast. The Bible mentions Jesus changed six stone water jugs into wine. Interestingly, a first century church was discovered in Cana. With the church, precisely six stone water jugs were unearthed as well. The "coincidence" is startling. However, the people dwelt among the Canaanites, as indicated in Judges 1:30. "Zebulun did not drive out the inhabitants of Kitron, or the inhabitants of Nahalol; so the Canaanites lived among them and became subject to forced labor." Many scholars feel it was laziness and unfaithfulness which prevented the Israelites from driving out the Canaanites. They became complacent, and allowed local inhabitants to dwell among them. As a result, many Israelites fell into pagan religious practices, forsaking the God of their fathers. Just as the border description is in question, so too are the lists of the Levitical cities found in Scripture. The Bible has two different passages concerning the Levitical cities. These passages are found in Joshua 21:34-35 and I Chronicles 6:77, and each list is different. The first passage is found in Joshua 21:34-35. "And to the families of the sons of Merari, the rest of the Levites, they gave from the tribe of Zebulun, Jokneam with its pasture lands and Kartah with its pasture lands. Dimnah with its pasture lands, Nahalal with its pasture lands; four cities." The second passage is found in I Chronicles 6:77. "To the rest of the Levites, the sons of Merari, were given, from the tribe of Zebulun: Rimmono with its pasture lands, Tabor with its pasture lands;"
One immediately notices the lists are not exact. Not only do the lists contain a different number of cities, but different cities as well. It should be taken into account the locations of Dimnah and Kartah are not known. The book of I Chronicles is a very interesting book. Spiros Zodhiates is a brilliant Biblical scholar. His analysis on the book is extremely insightful and illuminating. The name as we know it, I Chronicles, was given by Jerome. Jerome translated the Bible into Latin, the Latin Vulgate. He termed the book I Chronicles. The Jews knew the book as "the Words of the Days". Tradition has it Ezra himself wrote the book. The Books of Chronicles are one volume in the Hebrew Bible, and they were the last ones as well. Zodhiates continues to state "whoever the author was , he had access to many historical archives which have not been preserved". Thus to discredit the Biblical account over the seemingly conflicting passages these Levitical cities is to jump the gun. As stated above, populations shifted from time to time. The Books of Chronicles were written after the Jews returned from the Babylonian Exile. This was much later than the passage in Joshua. This fact, coupled with the words of Zodhiates, leave room for both accounts being accurate. Though perhaps this cannot be proven with certainty, neither can the opposite. The four heads were Judah, Reuben, Ephraim and Dan. "Then comes the tribe of Zebulun, and the leader of the sons of Zebulun; Eliab the son of Helon, and his army, even his numbered men, 57,400." The tribe fell under the banner of Judah , the first tribe mentioned by God to Moses and Aaron. The camp of Judah was the first to break camp. Their camp encamped on the east side of the Tabernacle, "towards the sunrise". Scripture seems to imply a certain honor with this position. Moses and Aaron camped on the east side of the Tent of Meeting as well, though inside the Tabernacle compound. The entrance to the Tent faced east, "towards the sunrise". The tribe's camp fell after that of Issachar. All together, the camp of Judah included 186,400 men, according to Numbers 2:9. They would have been one of the tribes in the front lines. As will be seen, the tribe manifested itself bravely on the battlefield in the Old Testament. The birth of Jacob's tenth son is recorded in Genesis 30:20. "Then Leah said, 'God has endowed me with a good gift; now my husband will dwell with me, because I have borne him six sons.' So she name him Zebulun." He was the tenth son of Jacob, the sixth and last of Leah. He was born following Issachar, thus the two tribes were close from the beginning. Throughout Scripture one finds him and Issachar interacting with each other. Tradition has it Issachar studied the Scripture and Law, whilst Zebulun provided for them through their profitable sea trade enterprises. The two tribes had a symbiotic relationship, and to this day the phrase "Issachar and Zebulun" is used to denote such situations. The name has been interpreted as meaning dwelling, habitation, abiding, to reside, or to dwell with. The name comes from the root Hebrew word "zabal", which means to inclose, i.e. to reside, dwell. Leah was sure Jacob would stay with her now, as opposed to Rachel, whom he had previously kept with. Jacob would be more prone to spend time with his new young infant son, as well as a young Issachar. The name represented Leah's joy over Jacob staying with, or residing with her rather than Rachel. Other interpretations exist, based on the Hebrew root the name is believed to have been derived from. Some claim the name derives from the Hebrew "zabhadh", meaning to bestow. Yet another claims the name may stem from the root Hebrew "zabhal", which translates to exalt, honor. Regardless, his birth brought a great deal of joy to his mother Leah. The name itself appears in ancient documents from Egypt. It appears in the Egyptian Execration Texts. These texts are two lists from the twentieth and nineteenth centuries B.C. which describe Pharaoh as seeking to bring magical powers upon his enemies. Interestingly, the name Job also appears in these texts. This is not an uncommon occurrence. The name Benjamin occurs as the name of a tribe in the ancient Mari Texts . The names Gad and Dan also appear in these same Mari Texts. Of the man nothing in Scripture is mentioned until the names of his children are given. He was absent in name from the Joseph narrative, however Targum Pseudo Jonathan claims Joseph presented him first to Pharaoh upon the arrival of the entire family to Egypt. He would have been among those brothers that sought to kill Joseph initially. While living in Canaan with Jacob and his brothers he bore three sons. These sons ventured with him into Egypt and are listed in Genesis 46:14. "And the sons of Zebulun: Sered and Elon and Jahleel." Numbers 26:26 sheds further light on his family. "The sons of Zebulun according to their families: of Sered, the family of the Seredites; of Elon, the family of the Elonites; of Jahleel, the family of the Jahleelites. These are the families of the Zebulunites according to those who were numbered of them, 60,500." The book of Numbers opens up with a list of the twelve men appointed by God to represent the twelve tribes of Israel and assist Moses. These men were the "head of his father's household". The tribal representative is given in verse 9. 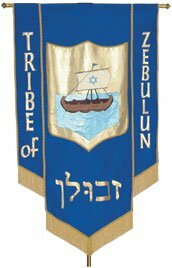 "of Zebulun, Eliab the son of Helon;"
These men were to stand with Moses, helping and assisting him in governing the fledgling confederacy, soon to be dynasty. With the help of these men, Moses and Aaron gathered all of Israel together. Verse eighteen record what must have been a remarkable sight. "and they assembled all the congregation together on the first of the second month. Then they registered by ancestry in their families, by their fathers' households, according to the number of names, from twenty years old and upward, head by head." These men were truly remarkable men, as they were at the core of forming God's nation and establishing themselves in Canaan. Numbers chapter 7 opens with Moses completing the Tabernacle. The tribes were to present offerings in celebration of the event. They presented these sacrifices in the order of the encampment. The tribe would have been the third tribe to present an offering, being a part of the first camp under Judah, and the third allotment within that camp. Verse twenty-four depicts the representative. "On the third day it was Eliab the son of Helon, leader of the sons of Zebulun;"
Six verses later God takes the first census of His people since their Exodus from Egypt. Each tribe is numbered by their fighting men, men twenty years of age and older. Each tribe was broken into families, headed by fathers. From these clans, the males twenty years old and upwards were counted. The first census recorded 57,400 men ready to go to war from the tribe. Numbers 10 depicts the 12 tribes of Israel as they pack up camp and leave Sinai. Verse sixteen mentions Eliab and the army of Zebulun breaking camp. These men would prove to be fierce warriors in future engagements with the Canaanites of Canaan. 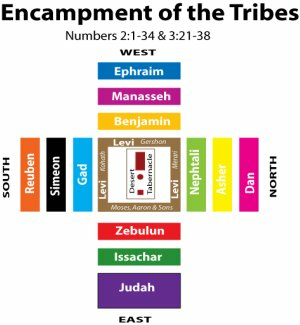 The standard of Judah was the first division to break camp. 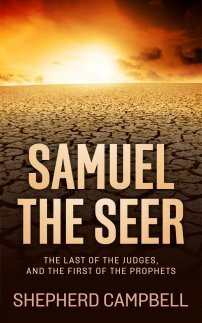 This tribe is listed as third, behind big brother Issachar. It would seem reasonable this was the order in which the standard of Judah set out. It was also the same order in which the sacrifices had been presented in chapter 7 above. Eliab was the tribal leader at the earliest stages of Moses leadership. However, it would be another man appointed by Moses to spy out the land of Canaan. Again, twelve men were chosen, one from each tribe. Numbers 13:10 lists the man from Zebulun. "from the tribe of Zebulun, Gaddiel the sons of Sodi;"
This man, however, would prove unfaithful. Though his name is not mentioned specifically, he would have been in the majority of spies who felt Israel had little to no chance to conquer and occupy the land. Their report stirred up the people; "and all the sons of Israel grumbled against Moses and Aaron;" The only two spies to report back faithful were Joshua and Caleb. "Take a census of all the congregation of the sons of Israel from twenty years old and upward." In Numbers 26:26-27 the tribe's ancestry and numbers are given. Remarkably the tribe had increased significantly in number over the course of the sojourn through the wilderness. In the first census, mentioned above, they numbered 57,400. The men of the tribe increased by 3,100 fighting males over the forty year journey through the desert! Verse twenty-five lists the tribal representative as Elizaphan, the son of Parnach. The Blessing of Moses is given in Deuteronomy 33. This blessing is often read in conjunction with the blessing of Issachar. The two tribes are once again seen in connection in Scripture. Deuteronomy 33:18-19 gives the blessing of Moses to Zebulun and Issachar. "And of Zebulun he said; 'Rejoice, Zebulun, in your going forth, And, Issachar, in your tents. They shall call peoples to the mountain; There they shall offer righteous sacrifices; For they shall draw out the abundance of the seas, And the hidden treasures of the sand.' "
This is the evidence many of the ancient Rabbi's and modern day scholars use to indicate the cooperative relationship between these two tribes. They are a tribe of fierce warriors. They obtain wealth from their proximity to the sea and sea based trade. Their wealth is shared with Issachar, which enables the men of this tribe to pursue their studies into the Law and other matters of God. The two tribes would soon come together for battle against heavy odds in Canaan. During the time of the Judges Israel constantly went astray. They would become enslaved, cry out, and God would send them a deliverer. In Judges 4 Israel is said to have been under the yoke of Jabin, the Canaanite king of Hazor. Scripture tells us his commander, Sisera, lived in Harosheth-hagoyim. 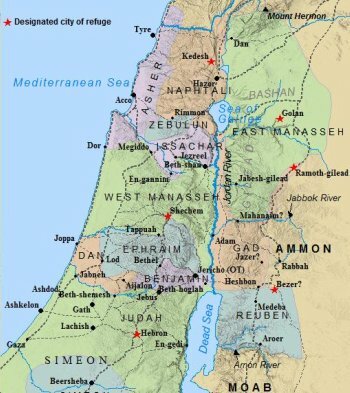 These cities were in the Jezreel Valley, thus would have involved the tribes of Naphtali, Issachar, and Zebulun, as well as Asher and perhaps West Manasseh. Jabin had nine hundred iron chariots in his military. These were far superior to the Israelites. Israel did not possess such equipment in their armed forces. The sons of Israel were enslaved under Jabin and Sisera for twenty years. Judges 4:4 names Israel's judge at the time. "Now Deborah, a prophetess, the wife of Lappidoth, was judging Israel at that time." Scripture tells she would judge Israel from "under the palm tree of Deborah between Ramah and Bethel". Deborah summoned for a man named Barak, from Naphtali. She informed Barak God had chosen him to lead the Israelites against Jabin. "Behold, the Lord, the god of Israel, has commanded, 'Go and march to Mount Tabor, and take with you ten thousand men from the sons of Naphtali and from the sons of Zebulun." The tribe is directly mentioned as comprising half of the force of Israel. These were fierce warriors, men of skill on the battlefield. Deborah issued orders to Barak to draw out Jabin and Sisera's men in the Jezreel Valley, near the Kishon River and the great city of Megiddo. Barak and Deborah set out for Kedesh in verse nine. Verse ten is the call to the tribe from Barak. "And Barak called Zebulun and Naphtali together to Kedesh, and ten thousand men went up with him; Deborah also went up with him." Engaging the chariots of Jabin on the open plain would have seemed like suicide for the Israelites. The chariot had a sure advantage over infantry on the open plains of the valley floor. The Canaanite chariots under Sisera gathered together near the Wadi Kishon at the summons of Sisera. He was in pursuit of the Israelites, and Scripture seems to indicate he gathered his men in haste from Harosheth-hagoyim in verse thirteen. It was at this moment Deborah called to Barak to issue the battle cry and charge. Verse fifteen relates the outcome. "And the Lord routed Sisera and all his chariots and all his army, with the edge of the sword before Barak; and Sisera alighted from his chariot and fled away on foot." Sisera fled on foot, alighting in the tent of a thought-to-be ally. Sisera falls asleep, and in verse twenty-one a tent stake is driven through his head by Jael, Heber the Kenite's wife. The Song of Deborah is found in Judges 5. This is believed by many scholars to be one of the oldest existing pieces of Hebrew literature in the Bible. Deborah praises and criticizes certain of the 12 tribes of Israel. Deborah also sheds light on the method by which Israel won. Her remarks praise the tribe's efforts in the engagement. She praises them on two separate instances. The first is in verse fourteen, and the second is in verse eighteen. "...And from Zebulun those who wield the staff of office."" This passage has been interpreted in different ways. Tradition has it this was a wood or metal instrument used to inscribe upon clay tablets or papyrus. One who used such an instrument would have been a scribe. This verse would seem to indicate, perhaps, Zebulun produced men of rank and leadership. They were known for officers. The second mention, in verse eighteen, describes a much more active tribe. "Zebulun was a people who despised thier lives, even unto death, And Naphtali also, on the high places of the field." The warriors of this tribe, it would seem, fought valiantly and with little regard for their own lives. They displayed courage and bravery, as well as leadership. 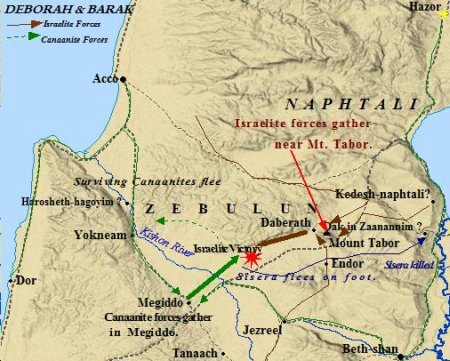 Zebulun and Naphtali led the charge on Jabin's army under Sisera, displaying faithfulness in the word of the God of Abraham , Isaac, and Jacob. It was a great victory for God Almighty and His nation, and a crushing defeat for the Canaanites. The Song of Deborah gives further insight into the conditions of the battle in verse twenty-one. "The torrent of Kishon swepth them away, The ancient torrent, the torrent of Kishon. O my soul march on with strength." God, in His divinely omnipotent understanding and knowledge, ordained this battle to take place during the rainy season. The Kishon, thus, would have been swollen with recent rains. These rains, if heavy enough, would produce some flooding in certain areas. Flooding would have rendered the Canaanite chariots useless. They would have been cumbersome, getting stuck in the soggy, muddy and flooded valley floor. The song of Deborah verifies the above scenario. Zebulun's performance was exceptional in this conflict and integral in the Israelite victory. This fact was not lost on the ancient prophets and judges of the past. In fact, the tribe was not done participating in some of the greatest victories of the Old Testament. The very next chapter in Judges 6 tells of the Midianite oppression of Israel and Gideon's deliverance of God's people. The tribe once again fought bravely against their Canaanite neighbors. They responded to Gideon's call in verse thirty-five. "And he sent messengers throughout Manasseh, and they also were called together to follow him; and he sent messengers to Asher, Zebulun, and Naphtali, and they came up to meet them." Thus the men of Zebulun once again rallied to rise up in arms against the Canaanite oppressors. However, God chisels Gideon's army down to three hundred men, and the men of Zebulun are not mentioned among those that pursued Midian after defeating them. Those tribes are mentioned in verse twenty-three. "And the men of Israel were summoned from Naphtali and Asher and all Manasseh, and they pursued Midian." Though it may be presumptuous to say so, it would seem Scripture implies the men of Zebulun were not in the three hundred of Gideon's army. They were not involved in the final defeat and pursuit of Midian. Only the tribes of Naphtali, Asher and Manasseh pursued Midian as recorded in Judges 7:23. However, they responded to Gideon's call, and may have fought amongst his 300. Their bravery in battle is certainly not in question. Nonetheless, the Israelites under Gideon defeated the Midianites that day in the Jezreel Valley. They battled the Canaanite forces on the slopes of Moreh and Mount Gilboa, setting the Midianites fleeing the way they had come. 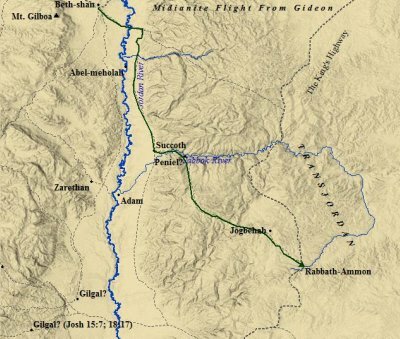 This route would have taken them through Succoth, Penuel, and Jogbehah, on their way to the capital of Rabbath-Ammon in the Transjordan. In Judges 12:11-12 Scripture relates the one judge Zebulun produced in Israel's history. "Now Elon the Zebulunite judged Israel after him; and he judged Israel ten years. Then Elon the Zebulunite died and was buried at Aijalon in the land of Zebulun." This is all that is recorded of Elon in Scripture. He is the only judge the tribe produced. Zebulun's influence did not end after the reign of the Judges. They are shown rallying to David's support in I Chronicles 12:33. "Of Zebulun, there were 50,000 who went out in the army, who could draw up in battle formation with all kinds of weapons of war and helped David with an undivided heart." This verse seems to suggest the Zebulunites were versatile warriors, able to use a variety of weapons and techniques for war. Their loyalty was unquestionable. Even more, verse forty tells how the tribes of Zebulun, Naphtali and Issachar bought supplies for the national celebration of David's kingship. "Moreover those who were near to them, even as far as Issachar and Zebulun and Naphtali, brought food on donkeys, camels, mules, and on oxen, great quantities of flour cakes, fig cakes and bunches of raisins, wine, oil, oxen and sheep. There was joy indeed in Israel." Not only were the men of Zebulun well equipped in weaponry for battle, but they were well prepared from the abundance of their land. Zebulun was well stocked with supplies and provisions. Like their father Jacob had said, they prospered from their many ventures both on land and sea. Zebulun appears again in II Chronicles 30:11. King Hezekiah restored the Temple worship in Jerusalem, and sent messengers "from Beersheba even to Dan" to call Israel to Jerusalem for the celebration of the Passover at the newly restored Temple. Scripture records that much of Israel "laughed them to scorn, and mocked them". However, verse eleven lists some of the faithful of God's people. "Nevertheless some men of Asher, Manasseh, and Zebulun humbled themselves and came to Jerusalem." Certain men from the tribe of Zebulun responded faithfully to the call of Hezekiah and journeyed to Jerusalem for worship at the Temple. The tribe of Zebulun finds itself involved in prophetic utterances of the great prophet Isaiah in Isaiah 9:1. "But there will be no more gloom for her who was in anguish; in earlier times He treated the land of Zebulun and the land of Naphtali with contempt but later on He shall make it glorious, by the way of the sea, on the other side of Jordan, Galilee of the Gentiles." This verse spoke of the birth of Jesus Christ, found in Matthew 4:13-15. "and leaving Nazareth, He came and settled in Capernaum, which is by the sea, in the region of Zebulun and Naphtali. this was to fulfill what was spoken through Isaiah the prophet, saying, ' The land of Zebulun and the land of Naphtali, by the way of the sea, beyond the Jordan, Galilee of the Gentiles,"
John the Baptist had just been taken into custody prior to this passage. Jesus, thus, withdrew into Galilee in verse twelve. This tribe witnessed many of the words and miracles of Jesus Christ, the son of God. Indeed the land was made glorious by the manifestation of Jesus. As wondrous as this time must have been, there yet remains more for the tribe of Zebulun in the age to come. Revelation 7:8 states that twelve thousand from the tribe of Zebulun will be sealed by God during the Great Day of Tribulation. Zebulun, thus, has played an important role throughout the various stages of the Old Testament and even the New Testament as well. The land of Zebulun played a critical role in the ministry of Jesus and His disciples. Scripture also confirms this tribe will be present in the age to come as well. Once again, in the New Jerusalem, God will call His people, and those of all the nations, together under His rule, and the people will stand united.